Created through a "student-tested, faculty-approved" review process with over 250 students and faculty, CB6 is an engaging and accessible solution to accommodate the diverse lifestyles of today's learners at a value-based price. Award-winning authors Babin and Harris cover essential topics of consumer behavior through a unique concept-driven presentation enhanced by online resources that appeal to today's students and encourage participation. New end-of-part cases highlight today's challenges, and the latest statistics on consumer behavior and contemporary examples reflect the most recent developments in business. New content demonstrates how the recent recession, green marketing, and natural disasters impact contemporary consumer behavior. Convenient chapter-by-chapter student study cards help users easily transition to this new edition. The CB6 Enhanced CourseMate interactive online resources bring concepts to life with learning and study tools that ensure user engagement. 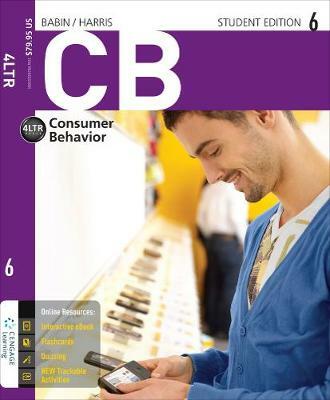 In an unforgettable presentation focused on users' needs, CB6 brings consumer behavior to life.